On Shabbat morning, January 28, 1950, the sixth Lubavitcher Rebbe, Rabbi Yosef Yitzchak Schneersohn, of righteous memory, passed on to his eternal rest. The Rebbe, Rabbi Menachem Mendel Schneerson, of righteous memory, was overcome with grief; for months afterwards, his every reference to his father-in-law would summon forth a well of tears. Though he was the natural choice for succession, he steadfastly refused to take on the role of "Rebbe." It was a full year before he succumbed to the entreaties pouring in from all corners of the globe and officially accepted the mantle of leadership. But from the very start, it was clear that he meant to carry on his father-in-law's work to reach out and embrace every Jew, no matter how geographically or spiritually distant from his people. On February 7, a mere ten days after Rabbi Yosef Yitzchak's passing, the Rebbe appointed Rabbi Michael Lipsker as his emissary, "shliach," to the Jews of Morocco. The institution of sending emissaries is without doubt the Rebbe's most revolutionary contribution to Jewish life today. It is no exaggeration to say that it transformed the face of Judaism in the second half of the 20th century. The concept is both profound and simple. 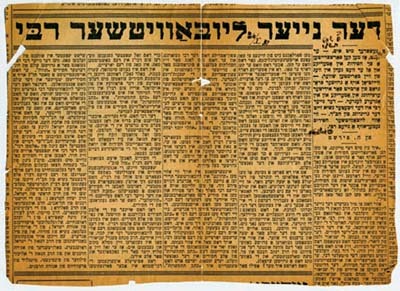 The Rebbe wished to reach every Jew on the face of the earth and to inspire in them an increased commitment to Judaism. But to reach every Jew is a task technically impossible for a single human being. So he raised an army of young men and women and said to them: I empower you to act in my stead. When you go out there—to New Jersey or to Alaska, to Belo Horizonte, Brazil or to Chelyabinsk, Siberia, it will be as if I myself am going there; as if I myself am giving that class, koshering that kitchen, or conducting that Passover Seder. An emmisary, shliach, is a legal concept in Torah law, by which one person can appoint another to perform an action in his place. The Rebbe took this Torah concept and transformed it into a calling and a way of life for dozens, and then hundreds, and then thousands of young families. The Rebbe did not allow his emissaries the luxury of mindless obedience to his dictates. Instead, he insisted that their programs and activities must arise from the particular strengths and inclinations of the emissary and the particular needs and circumstances of his locality. It was the Rebbe's unique type of leadership that could combine this with the fact that each emissary was suffused with the awareness that he or she is acting as an extension of the Rebbe's very person—which was what empowered them to overcome the otherwise insurmountable difficulties that lay in their path. The Rebbe felt a special kinship with his emissaries. When his wife, the Rebbetzin, passed away in 1988, his first request was "to notify [our] children, the emissaries." Before the Rebbe left his office on the day he suffered a stroke, in March of 1992, he arranged his desk—ordinarily covered with stacks of books and papers—leaving one item on its cleared surface: the three-volume album containing the pictures of his emissaries. The three loves—love of G‑d, love of Torah and love of one's fellow—are one. One cannot differentiate between them, for they are of a single essence. And since they are of a single essence, each one embodies all three. This is our "statement": If you see a person who has a love of G‑d but lacks a love of Torah and a love of his fellow, you must tell him that his love of G‑d is incomplete. And if you see a person who has only a love for his fellow, you must strive to bring him to a love of Torah and a love of G‑d—that his love toward his fellows should not only be expressed in providing bread for the hungry and water for the thirsty, but also to bring them close to Torah and to G‑d. When we will have the three loves together, we will achieve the Redemption. For just as this last Exile was caused by a lack of brotherly love, so shall the final and immediate Redemption be achieved by love for one's fellow. 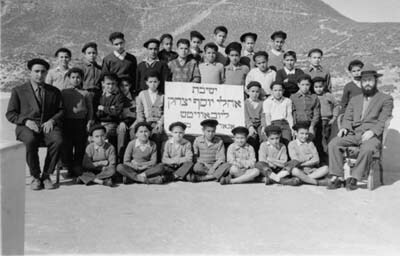 At that gathering, the Rebbe also laid down what was to become the leitmotif of his teachings and activities: that ours is the generation entrusted with the task of bringing to fruition the very purpose of creation, which Chassidic teaching defines as “making a dwelling for G‑d in the physical world.” Ours is the generation, said the Rebbe, which will herald the Age of Moshiach--the era of goodness and perfection which is the end-goal of man’s millennia-long effort to bring to light the divine image in which he was created. The Rebbe on "What is a Chossid?"? The fifth Rebbe of Chabad, Rabbi Sholom DovBer, was once asked: "What is a Chassid?" Replied the Rebbe: "A Chassid is a lamplighter. The lamplighter walks the streets carrying a flame at the end of a stick and goes from lamp to lamp to set them alight. He knows that he is not giving the lamp anything that it does not already possess—he is only revealing its potential for light." "What if the lamp is in a desert?" asked the disciple. "Then you must go and light it. And when you light a lamp in a desert, it will cease to be a desert." "What if the lamp is at sea?" "Then you must dive into the sea, and go light the lamp." "But Rebbe, I do not see the lamps!" "Because you are not a lamplighter." "How does one become a lamplighter?" "Refine yourself, and you will see the lamp within your fellow."